This is the second post about my winter break holiday at the end of July where I flew up to Puerto Montt for 2 weeks of exploring the region and to visit a friend’s family on the island of Chiloé. 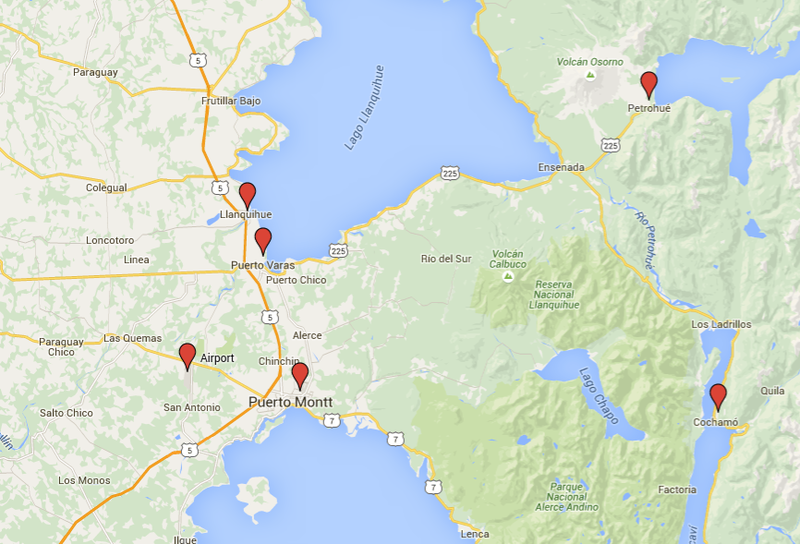 Part 1 is about my time in Puerto Varas. Usually I’m chilling in the far south in Punta Arenas. 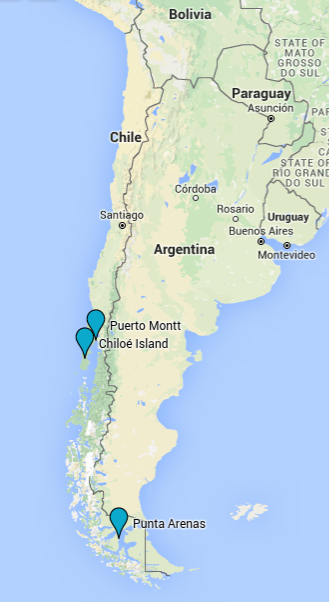 Time to explore another part of Chile with a flight to Puerto Montt! During my winter break I managed to finally get myself to a national park. I’d tried a few times to go to the local Reserva de Magallanes, but with the winter weather in Punta Arenas it had been closed every time. The weather was much better in this “southern” region of Chile so the only difficulty of getting to the parks was working out the buses. There was a small group of us going from the hostel and we all started the day with a big breakfast at a cafe. The bus stop in Puerto Varas is quite small so gets busy easily, and there isn’t much information – there was a small board with some destinations and leaving times but we were mostly relying upon what the hostel staff had said. After waiting quite a while the bus to Petrohué finally arrived and this was clearly the one everyone had been waiting for! Everyone crammed in and luckily we got a seat, although I felt sorry for everyone standing as this was supposed to be an hour and a half bus ride. Although I didn’t have to feel bad for long as people got off along the way, until just our group and a few others were left. Not much of a view – I hope everyone showered this morning! 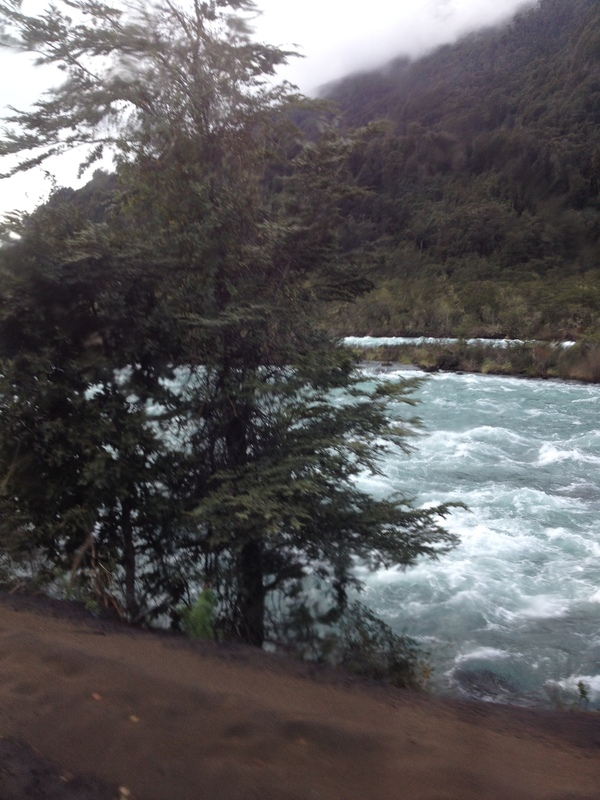 On the last leg of the road we followed a river and my heart start pumping with excitement – BLUE, GREEN, RAPIDS! I’d vaguely thought of making the most of being in Chile during the summer and try a bit of kayaking, but being down south in the winter you lose touch and get on with other things. Seeing the continuous rapids put me back in kayaker mode where I was craning my neck to see as much as possible. Kilometres of lush turquoise rapids with a green mountainous backdrop. I’m definitely kayaking while I’m in Chile! The buzz and energy came back and I wanted to be on that river. Unfortunately we weren’t here to kayak, so we checked in with the rangers and began our wander around the national park. All the national parks have marked routes that you have to stick to, something that surprised me. I’m used to walking in the UK where some places have paths, but you need a map if you plan on exploring or for when the path magically disappears. It was actually nice to walk with such beautiful scenery and not worry about getting lost. We did get confused at one point when the trail came out on to the beach by the lake, and apparently just stopped. But a hug of the treeline and some wet shoes got us further down to meet back up with the path. The trails are well marked, with signs at junctions so we could just chat to our new companions and enjoy how green and fresh everything was. And by fresh and green I mean NO SNOW! 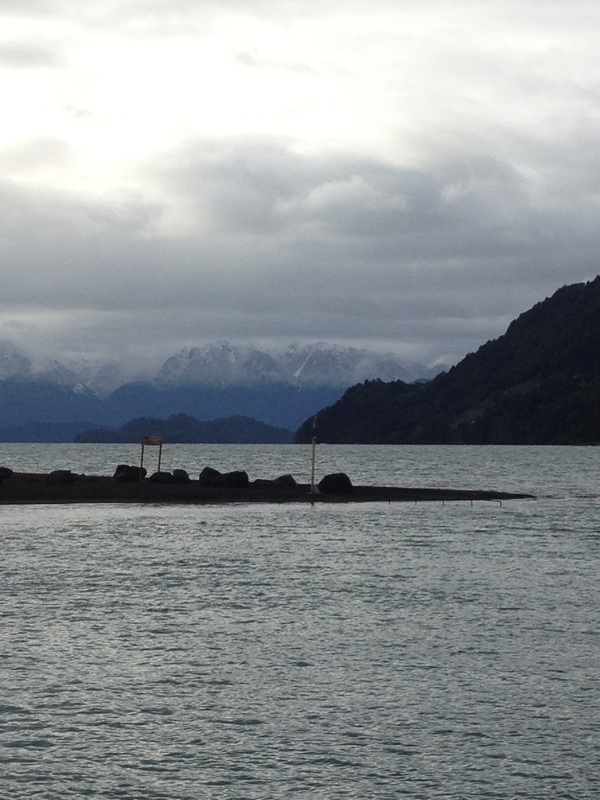 We could see the snow line atop the mountains, but it was great to wander around without worrying about falling on ice. The trails were a nice mix of open ground to enjoy the views and jungle-like winding paths nearer the beach. The nature all around us was a breath of fresh air after being in winter for so long, but the paths we were walking on weren’t in their usual state. 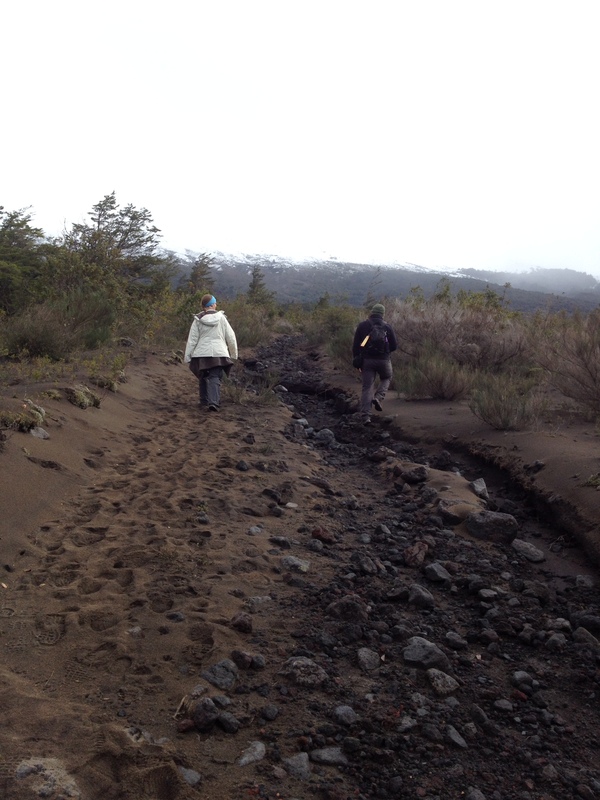 During my first week in Chile Volcán Calbuco erupted leaving a thick layer of ash everywhere. The whole path was like walking on sand, and in some parts you could see small bushes trying to creep back up from the ground. The last part of the walk was a mad rush to get back the the start so that we didn’t miss the last bus home. The shorter path along the beach was only open in summer – otherwise it’s a swim back! So with an hour and half to do what normally takes over two hours we walked as quickly as possible. This was a lot easier said than done, seeing as the entire path was “sandy” with ash. We met back up with the start of the loop, leaving us an hour to get back where it took us and hour and a half on the way. Walking quickly on sandy ground is tiring! 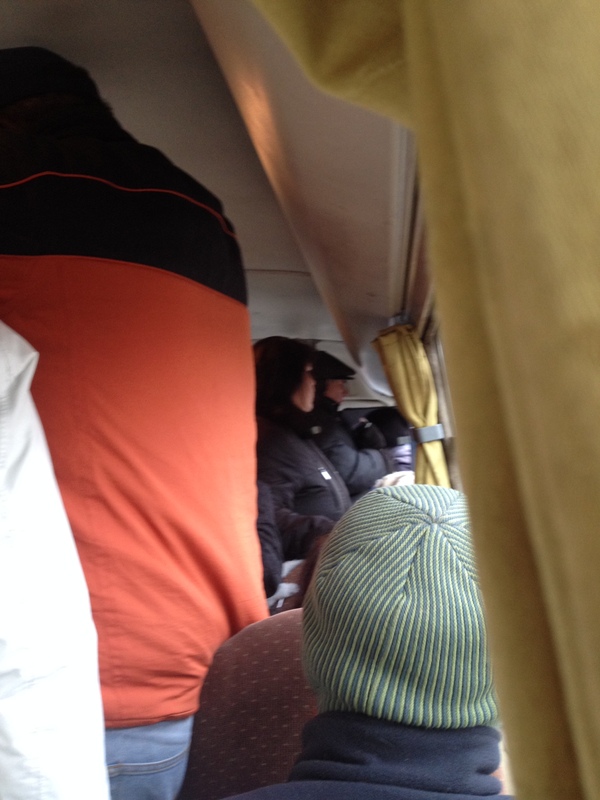 Thankfully we got there with time to sign out with the rangers and hop on the bus for a snooze of a journey home. The whole day was a nice reboot back to nature so me and Susan decided we’d try to see some other parks in the region too. This was another thing that’s easier said than done. Out trip in to Cochamó valley a few days later was cut short by bus timetables that spontaneously change, leaving us stuck in the ugly city of Puerto Montt for longer than we’d’ve liked.